Kathy Louis has made an immeasurable contribution over the course of many years through her work within our criminal justice system. Born and raised on the Samson Cree Nation in Alberta, she attended residential school for six years before returning to attend school on her reserve. As well, she attended high school and college off reserve. Ms. Louis began her career working for the City of Edmonton. She relocated to British Columbia and graduated from Simon Fraser University in 1974. Following graduation she was employed as a cultural consultant in child welfare and social service areas. Additionally, was a resource person for non-native organizations in order to better serve Aboriginal people. She joined the federal government in 1977, and was appointed to the National Parole Board the following year. Ms. Louis spent 25 years on the board, its longest serving member. She brought a high level of awareness about cultural diversity and traditional Aboriginal cultures, culminating in 1991 with the establishment of Elder assisted parole hearings. Ms. Louis became a central figure and advocate for restorative justice policies and practices in British Columbia, Canada and internationally. 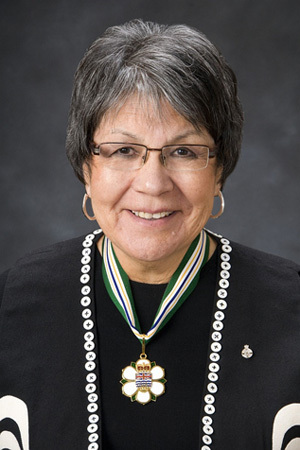 A fine educator, motivator, innovator and community support builder, she has made a tremendous effort to build a positive relationship between Aboriginal and non-Aboriginal British Columbians. In addition, Ms. Louis has made a significant contribution through volunteering. She sits on several boards and informally provides guidance to young Aboriginal professionals. Throughout these contributions, she has always conducted herself with integrity, passion and compassion. Ms. Louis’ true gift is as an educator and a person who provides hope to those who previously had none.